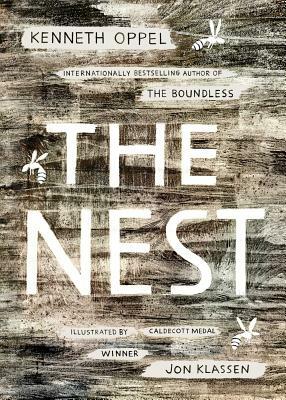 The publisher synopsis of celebrated author Kenneth Oppel's new book The Nest states that it is an eerie masterpiece, and eerie seems like the best word to describe it. It is not scary necessarily (unless you have a phobia about insects), but it does leave an impression and Jon Klassen's illustrations highlight the loneliness & grief of Steve's family's struggle to cope with the serious illness of their newborn baby. Steve just wants to save his baby brother—but what will he lose in the bargain? Kenneth Oppel’s (Silverwing, The Boundless) haunting gothic tale for fans of Coraline, is one of the most acclaimed books of the year, receiving six starred reviews. Illustrations from Caldecott Medalist Jon Klassen. Jon Klassen is a Canadian-born author-illustrator. He has written and illustrated the acclaimed Hat series, including I Want My Hat Back, This Is Not My Hat, and We Found a Hat. Highlights of his illustrated books are Cats’ Night Out by Caroline Stutson, Sam & Dave Dig A Hole by Mac Barnett, The Dark by Lemony Snicket, and The Wolf, The Duck & The Mouse also by Mac Barnett. His books have won a Caldecott medal and two Caldecott honors and other international awards. He lives in Los Angeles, California, with his wife and son. *"With subtle, spine-chilling horror at its heart, this tale of triumph over monsters—both outside and in—is outstanding....Printz-winning, New York Times best-selling Oppel and Caldecott-winning Klassen are a match made in kid-lit heaven. Expect ample buzz." * "Oppel uses a dark and disturbing lens to produce an unnerving psychological thriller." * "Emotionally haunting...This affecting middle grade psychological thriller is recommended as a first purchase"
* "a tight and focused story about the dangers of wishing things back to normal at any cost....the emotional resonance is deep, and Steve’s precarious interactions with the honey-voiced queen make one’s skin crawl."